Google makes several updates to its search engine ranking algorithm every day. Some of Google’s updates come and go, without any real notice. Other updates go live, only to be rolled back several weeks later. Mention these updates to any SEO and their expression will tell you how badly their websites (or their clients’ websites) were affected. Another of Google’s famous updates didn’t quite have the same cute name associated with it. It’s merely known as the “payday loan” update. In 2013, Google rolled out their payday loan update in a bid to improve the payday loan SERPs that were being crammed full of websites that had gamed the system through spammy SEO tactics. 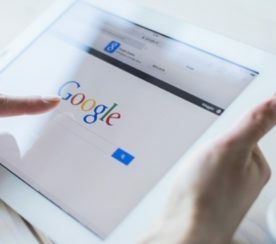 In the five years since that Google update, the payday loan industry has been a constant battle of websites that try to outsmart Google versus those that play the long game – and hope that doing things “the right way” will pay off. Of course, all this changed again in August 2018. Some people referred to this one as the “Medic” update because, initially, it appeared to target a number of medical websites. However, since the initial rollout, we can see that the update has impacted sites far wider than the medical niche, including payday loans. One reason why this update is still being talked about today is because few websites have been able to recover. 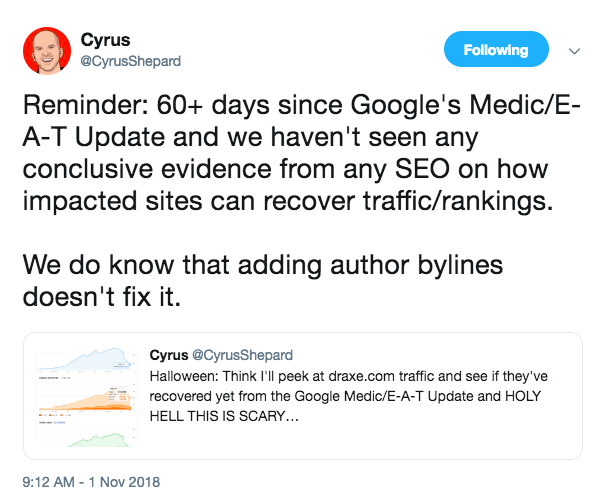 In fact, SEO expert Cyrus Shepard even tweeted that, after 60 days, there hadn’t been a single case study on how sites can recover from the Medic update. Until now, very little has been written in terms of practical advice on how to regain traffic and rankings. Sure, you can always read the 160-page Search Quality Ratings Guidelines document from Google. Another approach is to “publish great content” and hope your rankings recover. Or, you can follow the steps outlined in this case study – from Peachy.co.uk – as we share how we recovered within 60 days, and how you can apply the same strategies to your own website. Was I Hit by the Medic Update? Each time Google rolls out a new update, the first thing to do is to check whether your website was impacted. The organic search traffic report in Google Analytics will visually show you if there’s been a traffic drop – especially if you look at the last 30 days of traffic. If it’s unclear, or you want to be extra vigilant (like me), Barracuda’s SEO tool overlays the latest Google updates on top of your organic search report, so you can quickly see whether an update has had an impact on your search traffic. In the case of the Medic update, yes we were hit! Organic search traffic dropped immediately after the update. In fact, Peachy lost 18 percent of organic search traffic overnight. A drop in traffic and rankings meant we could lose up to 100,000 visits per year, which we cannot afford to lose! Identified key pages we wanted to improve. Then created an action plan. I’m going to share our Google Medic Update recovery process with you now. By implementing the following SEO techniques, we have been able to recover organic search traffic in less than two months! These techniques include content rewrites, 301 redirects, on-page SEO, and outbound linking. Payday loan sites are notorious for hiding their contact information. But, unlike other lenders, Peachy has always displayed their contact information on their website from the main navigation menu. The same goes for their About Us page. These two pages are important. They help us establish trust with would-be borrowers. However, both of these key pages were thin on content and were poorly written. And they did not communicate trust. Are lending from a trustworthy provider. Should they have any questions, they can contact the lender with ease. For the contact page, we went above and beyond and listed all the possible ways a potential customer could contact us, should they wish to do so. This included phone, email and web form and – going on step further – we also link to our complaints policy in case anyone wants to file an official complaint. We were not hiding from complaints. And we wanted to make this clear. Another change we made was to list our support response rate. According to customers themselves, the best way to provide excellent customer service is to respond quickly. Peachy has an unusually fast response time, with 95 percent of all support requests being answered within 90 minutes – so, we included the response time on the page to meet (and exceed) expectations. The About Us page used to have zero words. It was just an infographic with a brief outline of the history of the company. And that’s fine for many companies, but we wanted to really emphasize why Peachy is a trustworthy provider. And the infographic wasn’t enough. Our company history (more in-depth). Our certifications from industry organizations. And to make it clear that not everyone who applies for a loan will be accepted. In fact, only 12 percent of all applications are accepted. Even though we’re a business, it’s not just about giving out loans to as many people as possible. Our customers’ best interest comes first, and that’s why our customers trust us. Plus, both landing pages can now be accessed from the main navigation menu. 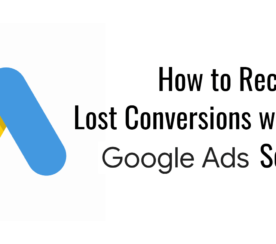 Since making these changes, our conversion rates (on those two pages only) have increased by more than 30 percent. 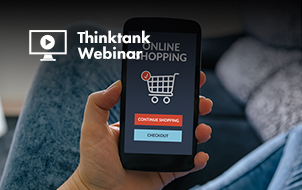 Earlier this year, we looked at the click-through rates for several of our top landing pages and saw room for improvement. When comparing our own metadata, we noticed we weren’t as aggressive as our competitors. For example, the title tag for our home page was “Short term loans at Peachy UK”. Sure, it might work, but the competition was far more aggressive – with an emphasis on urgency and those who needed money now. Until the Medic update hit. 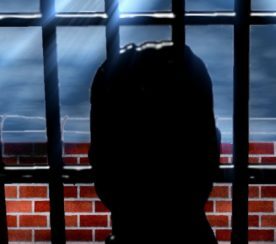 If we look at some of the sites that were affected, we can see that pushing people to sign up and take out a high-interest loan goes against Google’s guidelines – as it interferes with their personal finances. So we decided to switch back to being more conservative (and more trustworthy). 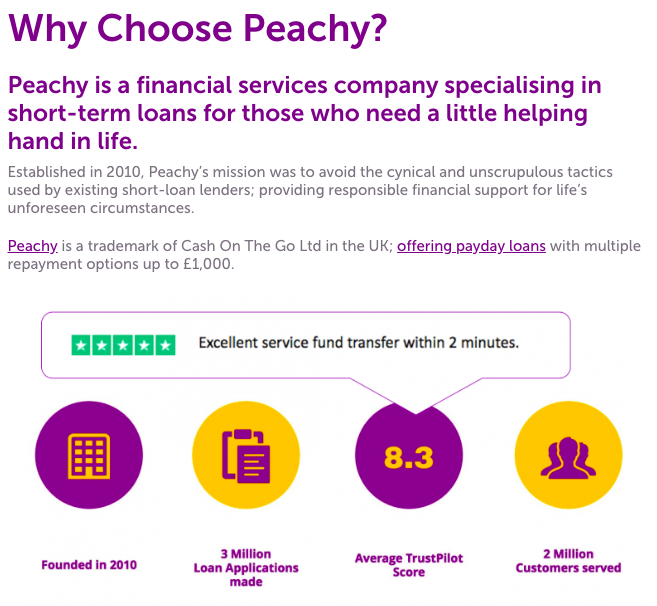 Today, our title tag is: “Short term loans at Peachy (trusted by 2 million customers)”. Since doing so, the CTR for our home page has increased from 7.3 percent to 10 percent – resulting in more than 4,500 additional visits. Instead, we focus our title tags to emphasize trust, leveraging star ratings and verified reviews. The Peachy blog has had an interesting history. It used to be a place where we shared personal finance advice. Over time, however, it lost its way and started to produce content for the sake of publishing new content. The quality was poor. The topics were rehashed. And the results weren’t very good. By August 2017, blog traffic was close to nothing. Actually, it was one piece of content that was generating 800 visits. The rest were almost non-existent. So, we went back to basics and started to publish one high-quality piece of content per month. 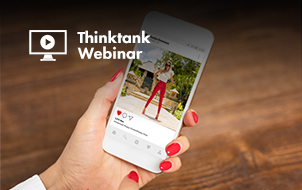 What does high-quality content look like? This strategy was working well, until August 1 came around. We needed to showcase our expertise, but producing one blog post per month wasn’t enough. Becoming an expert doesn’t happen overnight, so we’re now doubling down on blog content and have published two posts per month since September. Again, the focus is on quality advice and we try to include our own experiences as much as possible. Cite a lot more research. Share things we’ve learned along the way. Make sure we’re not rehashing the same content found on every other personal finance blog. Have you ever performed an advanced search operator, only to find out that you have several landing pages targeting the same keyword? What we found was that more than 10 landing pages were targeting the same keyword! That’s a lot of similar content and thus, we ended up competing (and cannibalizing) for the same keyword. So, we decided to merge the content into a single landing page. First, we identified our most linked to piece (page A), and then took the copy from pages B, C, and D, inserted it into page A and then rewrote the content to keep a consistent message, tone of voice, and flow – and then we ran the page through Fetch as Google via Google Search Console. Avoiding duplicate content issues is not just an important part of the Medic recovery, but an important part of any SEO strategy. 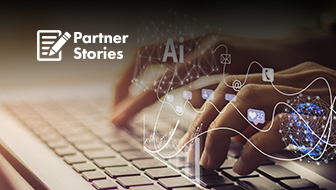 Another benefit of merging content together is that our overall content length has increased from an average of 500 words to 1,200 words, per piece. 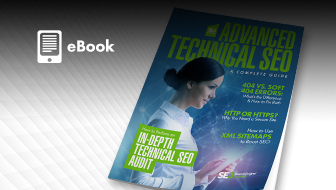 As with other techniques, we repeated this process for more than 10 strategic keywords and reduced more than 20 pages into only a small handful of landing pages. Once we merged content together, one thing was immediately clear. Sure, inbound links is what gets you high rankings, traffic, and sales, but outbound links are also important for SEO. On average, our content – now at 1,500 words – linked out to only 1-2 websites. 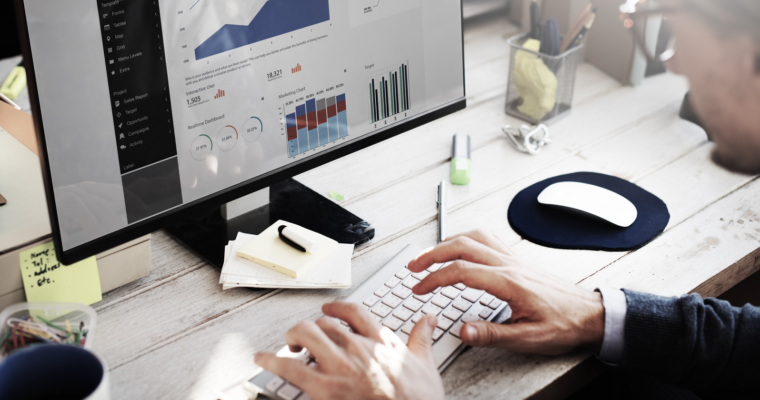 By not linking or citing original research in our content, we were missing out on a golden opportunity to improve one of the most important aspects of SEO – website authority. “Average wages and house prices continue to grow and it’s almost impossible to reach for many first-time buyers. Again, we performed the same exercise on several of our key landing pages and now average 16-18 outbound links per piece, rather than the 1-2 we originally had. At this stage, you’re probably wondering… did it work? Well, it’s been about four months since the Medic update went live – and given that it took 2-4 weeks to analyze and implement these changes, we have 2 full months worth of data to review. So, let’s take a look at organic search traffic. 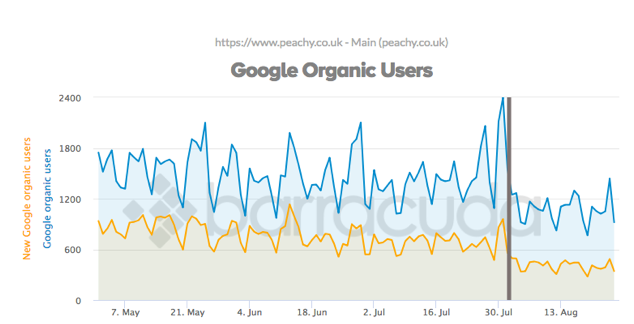 Peachy lost 18 percent of organic search traffic overnight. That’s a lot of lost traffic! In July, we generated 47,000 organic search visits. In August, that number dropped to 38,000 visits. But, after a brief dip in traffic, we’re now almost back to pre-penalty traffic levels and in October, we generated 43,000 organic search visits. For the last 30 days, traffic has reached 45,000 visits – meaning we’re well on our way to a recovery. The business is doing well; our keyword rankings are improving and blog post traffic has increased from 800 visits per month to now 2,900 visits. Best of all, the content has started to earn editorial backlinks and so far, we have earned links and mentions from The Express, Quora, and Financial Highway. If you were hit by the Medic update, then chances are you’ve been scrambling for information on how to recover since August 1. 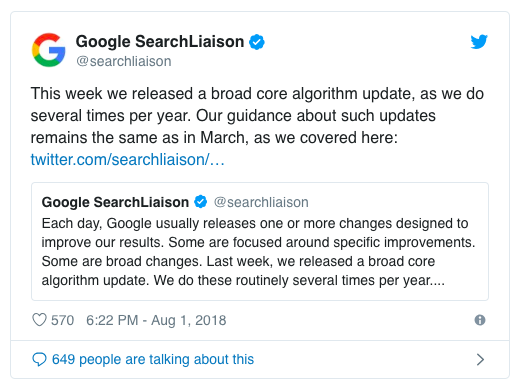 Sure, there’s a lot of best practices that regurgitate the same old SEO techniques – but very little in terms of practical strategies you can use to recover from this specific update. Identified pages that needed to emphasize trust and improved them. Linked out more to authoritative sites. Doubled down on producing high quality content to showcase our expertise. This won’t be the last time that a Google update hits us, as we’ve been hit with penalties before. Just like last time, we’re doing all the right things – and Google is noticing, which is why we’re able to recover.